How to convert decimal to octal, with example. Enter the decimal (base 10) number you would like to convert into an octal number. Note that the entered number must be positive and may only consist of digits 0-9, a single decimal point, and the leading number must not be a zero. For numbers containing a decimal point, the converter will only convert out to the last digit entered. This is the octal equivalent to the entered decimal number. Note that after clicking the Convert Decimal to Octal button the converter will display a result summary and an interactive conversion chart below this line. 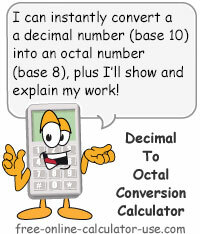 This calculator will convert decimal numbers into octal numbers and display an interactive conversion chart to show how it arrived at the result. Enter the decimal number you want to convert to octal. Click the "Convert Decimal to Octal" button. This will display the result of the conversion and generate an interactive conversion chart with tap-enabled help cells. Number system that uses the base 8 system of expressing values, which consists of the digits 0,1,2,3,4,5,6, and 7. Base 8 numbers are usually written with a subscripted 8 behind them (1758). What an octal number is and how to convert it to a decimal number. The easiest way to understand what an octal number is, is to compare it to something you already know -- a decimal number. As you know, a decimal number uses the base 10 system for counting and expressing value. It's called "base 10" because it uses ten numeric characters (0, 1, 2, 3, 4, 5, 6, 7, 8, and 9) to count and express values. The octal number system, on the other hand, uses the base 8 method for counting and expressing value. It's called "base 8" because it uses 8 numeric characters to count and express value. The 8 octal numeric characters are 0, 1, 2, 3, 4, 5, 6, and 7. As you can see, since each place value in a base 10 number is different than the corresponding place value in a base 8 system, we need a method for converting 0-9 base 10 place values into 0-7 base 8 place values. In order to convert a base 10 number into a base 8 number, the first step is to find the first base 8 place value that is greater than or equal to the decimal number you are converting -- starting at the 80 place and working your way to the left. For example, suppose you want to convert the decimal number 125 into an octal number. In that case you would find the first base 8 place value that is greater than or equal to 125, which would be 512. Once you have located your base 8 place value starting point, the next step is to create a conversion chart like the one shown below. Notice that the decimal you want to convert is placed in left-most cell of Row B, just above the base 8 place value row (C). Combining the numbers in the last row of the chart we can see that the base 10 number 125 converts to the base 8 number 175 (1*64 + 7*8 + 5*1 = 125). Note that the leading zeros are dropped since they represent no value (just like the base 10 system). As you can see, converting a decimal number to an octal number is a simple process of identifying the first base 8 place value greater than or equal to the base 10 number you are converting, and then dividing each place value into the remainder of previous division.